I took time to visit Chris Attewell in his shiny new chocolate den, and was amply rewarded! For my last post I brought you an interview with one of the new band of micro-batch bean to bar chocolate makers that are excitingly growing in number in the UK. Equally exciting to me is discovering chocolatiers and pastry chefs with understanding and sensitivity, who recognise chocolate’s full potential and are making the most of it. One such chocolatier is Chris Attewell, founder of The Winchester Cocoa Company. Chris launched his business in October 2014, and it has rapidly become clear that he is a fine talent. A lot of industry interest and a growing clutch of awards are testament to that. 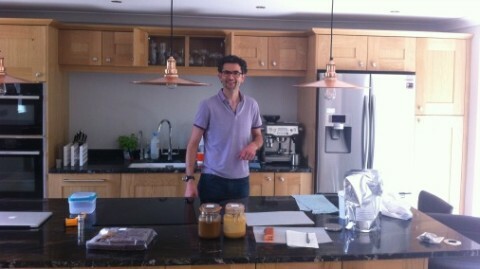 Chris in his shiny new chocolate kitchen. Although the business is very young, Chris has long been interested in food. When he was a boy it didn’t appear to be a viable career for a boy from Southampton. Consequently he established and ran a successful web development company with his brother for the first eighteen years of his working life. But during the recession, when business was tough, he began to question some of his previous choices, and decided to finally pursue something that had long been a passion – chocolate! As Chris puts it: chocolate appeals to geeks. There is of course all the technical knowledge and skill required, and all the different formulas and textures, but he was also truly excited by chocolate’s diversity of flavour, the journey it can take you on. Experiments with flavour have paid off with these stunning bars. Chris set himself to learn all he could. He read books by the masters. He experimented with desserts and patisserie using his existing skills, which allowed him to explore flavour. And he studied new techniques, taking courses at the chocolate academy at Banbury, and with UK Chocolate Master Mark Tilling. The first I knew of Chris was when he contacted me. He had a launch collection and was looking for feedback, looking to find out if he had what it takes, if his work was good enough to create a viable business. I am always open-minded when people want me to taste their work. You never know when you will uncover something truly worthwhile. And on that occasion I did. An initial phone-call revealed intelligent thinking and that he was using fine quality couverture. It doesn’t inspire confidence when people launch a chocolate business with minimal understanding of their primary ingredient and their choice of couverture leaves much to be desired. These pretty Easter eggs were fine examples of Chris’s precise work. A smartly branded, brown paper box arrived, containing chocolates at once beautiful and precise in their execution, interesting in their flavour combinations, delicate and full flavoured in their delivery. Very fine indeed! 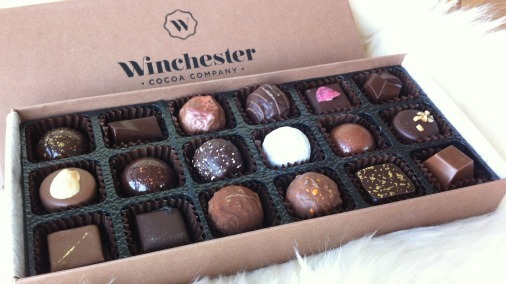 The box that arrived wildly surpassed my expectations of a newbie business, and so began a wonderful journey into discovering Chris and The Winchester Cocoa Company. Having started the business with minimal equipment in his own kitchen at home in Winchester, said kitchen has recently needed expansion. At the end of July I went to visit Chris, to see the new kitchen, catch up on his plans for the business, and of course to taste some chocolates! Still nestling in their moulds, pralines awaited me. Chris met me off the train at Winchester station, and the following tour and very fine lunch at a stylish café are evidence of what a nice town it is. Café culture abounds, and the presence of a tempting new Chococo shop and café are evidence that Winchester is taking its chocolate seriously. At present Chris doesn’t have his own shop – but a shop/café/patisserie are in his long-term plans. It is however easy to buy his things online, and at various shops and markets. Back at HQ the gleaming new kitchen boasts workspace aplenty, but a reassuring lack of gadgetry. I am impressed by Chris’s work ethic, and not a little mystified as to how he manages to create such precise and pretty pieces with only a few moulds and a dipping fork to aid him. 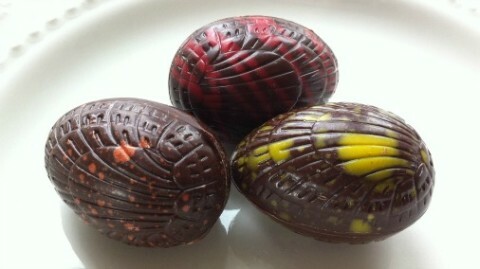 Really elegant handmade chocolates are a relatively rare joy to behold. Lapsang & Kampot pepper, genius! 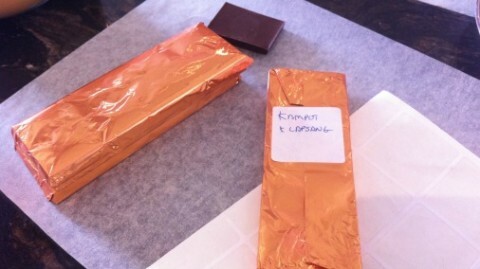 First up, the glowing bronze foil of an as-yet unwrapped bar beckons. A new flavour Chris has been working on and not yet put into full production. But it has been perfected, and Chris would like me to try it. Yes please. This latest flavour is a dark bar – Lapsang tea and Kampot pepper. Intriguing. What really thrills me is that it is among the first things he has created with chocolate from A. Morin. When I first talked to Chris he was working with Felchlin couverture. A fine Swiss company. 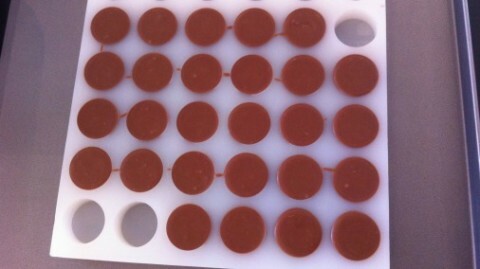 Their chocolates are consistently fine quality and consistent to work with. But as any chef with a curious palate, intent on eeking the best out of each recipe ought to be, Chris has been exploring and tasting. He is now working also with A. Morin, whose excellent chocolates are wonderfully diverse and interesting, with Chocolate Madagascar, who are producing good, fruity, and very useful chocolates, characteristic of the country’s fine cacao, and with Pump Street Bakery, one of the finest micro-batch chocolate makers in the world. I like Chris’s moulds too, interesting, but elegantly simple. It is hugely thrilling when a fine chocolatier chooses to expand their palette of possibilities and embrace the diversity of options out there. 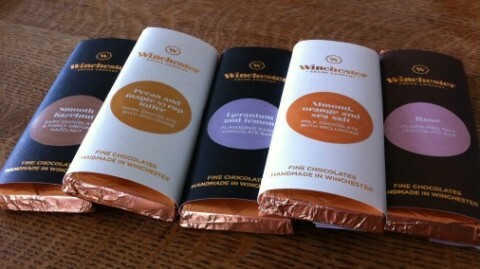 The Winchester Cocoa Company is showing evidence of some thrilling collaborations. The Lapsang and Kampot is made with 63% Dominican Republic Yamasa Noir. The result is a chocolate that delights immediately. It has a gorgeous aroma, with the promise of fruit and a fine aromatic quality. It is very fruity, with a delicate balancing smoke. It doesn’t taste of Lapsang, it is a barely-there back-note – but this would not be the rounded, full flavoured bar it is without it. Just the right amount of heat and spice warm up the middle and ending of what is a truly delicious new bar! I am promised this will soon be available to buy. I’m going to be first in the queue. 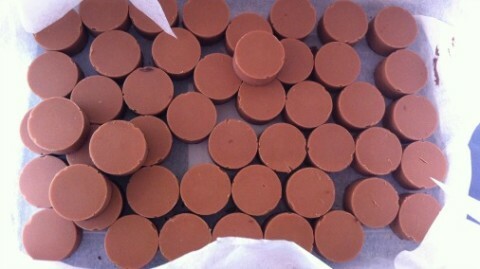 Pralines centres ready to taste. Chris has been experimenting with his new couverture choices, swapping out the chocolate used in some of his existing recipes to see what creates the finest result. His Almond and Mandarin Praline is a piece that I have always liked, its indulgent milk chocolate brilliantly balancing nuttiness and the bright citrus note. Reworked with a higher percentage chocolate, the A. Morin Jamaica 48%, it is even more delicious. The couverture has hazelnut, biscuit, and a fugdey quality. 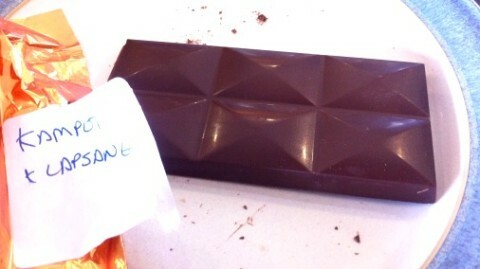 Now this praline has greater depth, with deeper toffee notes added to what was already a winner. 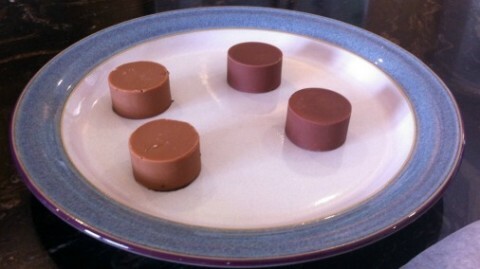 The same Almond & Mandarin praline made with two contrasting milk chocolates. When it comes to the nuts in his work Chris is also tasting around and refusing all but the best. His discovery of Pariani, the peerless Italian nut products company, is making a big difference to his work. I spent a happy time with Chris at the Pariani stand at last year’s London Chocolate Show. Once you have tasted their things there really is no going back. The Winchester Cocoa Company now has a dark chocolate and hazelnut bar, the smoothest marriage of two perfectly matched components. This bar has already won a gold award at this year’s British round of The International Chocolate Awards. 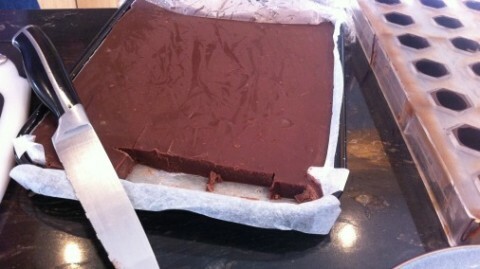 And it was generally felt that this was as fine an example of gianduia as we had seen outside of Italy. A zingy ganache with yuzu and chilli. During my day in Winchester it became increasingly clear that Chris is now giving full rein to his inner geek – revelling in the different couvertures, different makers, different ingredients, in understanding the different flavours, and how their characteristics can work for him. 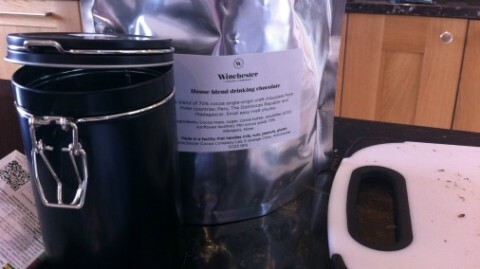 The Winchester Cocoa Company house blend hot chocolate. One of his latest creations is a house blend hot chocolate. I tasted two versions – a pure unadorned cup of heaven and a fantastic hazelnut version made by adding hazelnut paste and a touch of hazelnut liqueur. Unlike the current trend for many gourmet hot chocolates made with fine couverture this is eminently drinkable. While they can taste really delicious, the trend for so-thick-you-can-stand-your-spoon-up-in-them hot chocolates does leave me frequently unable to make real inroads into the cup proffered, let alone finish it. 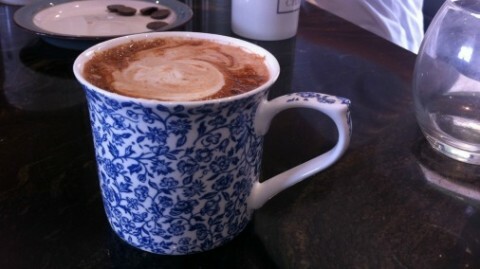 Chris’s drink is truly quaffable, and tastes like warming, nostalgic-but-better hot chocolate should. This is created with a mix of the new couvertures he is using, chosen and balanced to create something delicious, interesting but not overly intense. Classic, but done brilliantly. Hot chocolate bliss! This one was hazelnut enhanced. Chris will be selling his hot chocolate for you to make at home, and he also hopes to sell it in to other businesses and cafes. They can then benefit from his work and know-how, and soon be serving truly desirable hot chocolate. The hot chocolate was a treat in a day of treats, an example of a great product from a chocolatier thinking each recipe through, aiming high, but taking the right amount of time to get there. It is testament to his drive and talent that he is getting there very quickly indeed!